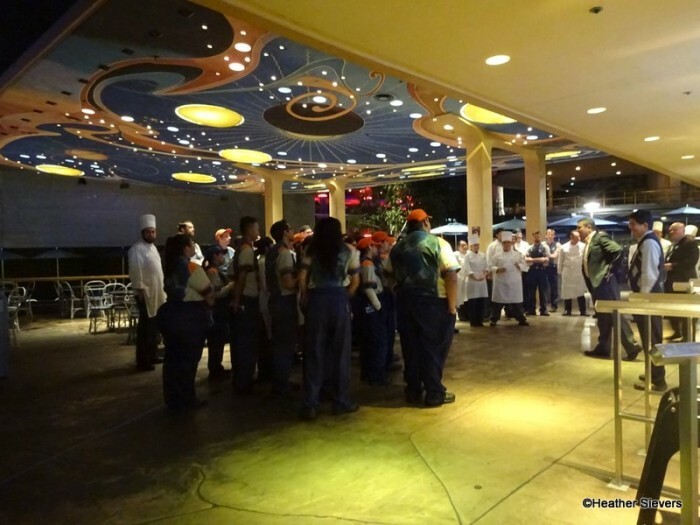 It was really neat to see the team prepping for the opening moment! And here it is in real life. Now before anyone gets all bent out of shape about how it looks and what might happen if you eat it, let’s talk about a few things. 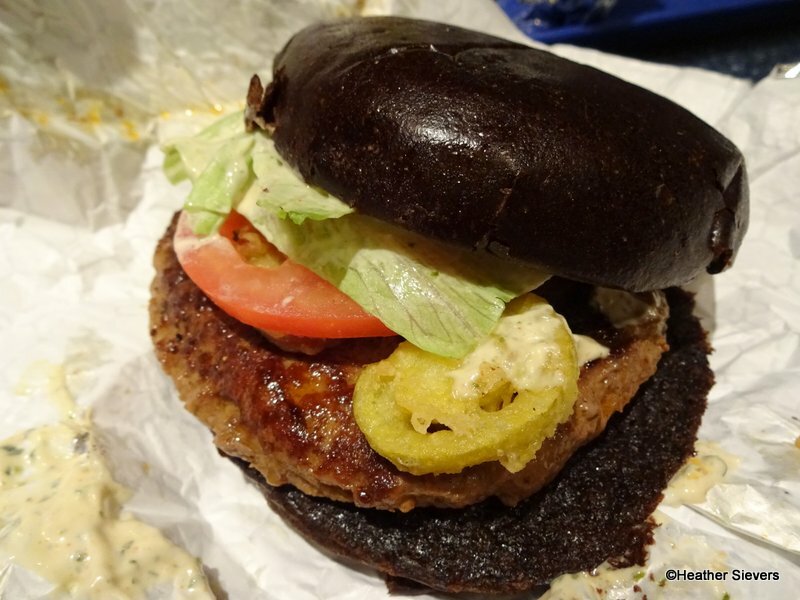 The black bun is colored with a caramel color; it’s actually more of a very dark brown. AND it will not make anything “turn green” in the restroom. 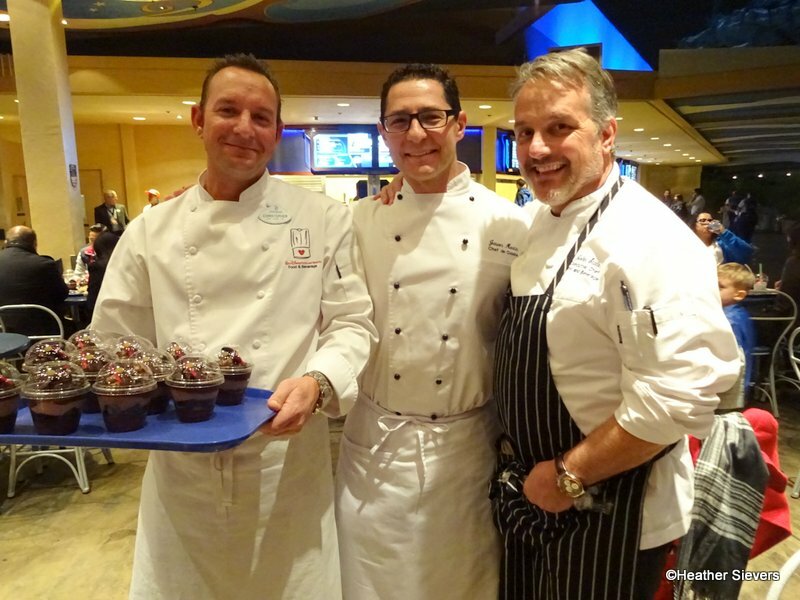 I know this may be disappointing to some, but it’s the truth, I was told so by 3 of the most important chefs of the Disneyland Resort! The Dark Side Burger features an Angus Beef (85%) and Chorizo (15%) patty. It’s topped with Fried Cherry Peppers, Spicy Lime Aioli, Lettuce and Tomato, and it’s served with Fresh Fruit or French Fries. 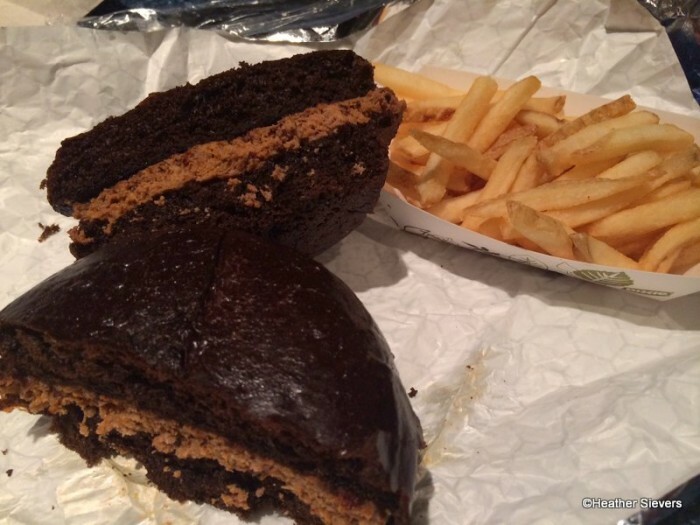 My husband had this burger and despite its looks, he said it was actually pretty tasty. He did mention the he’d prefer it without the aioli. 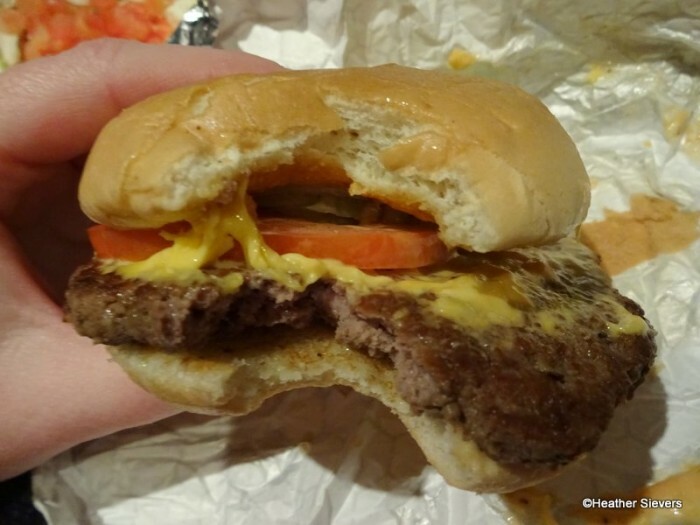 My boys ordered the same burger, but plain; just meat and bun. I was surprised that they really liked the patty because being partially chorizo, it has a little bit of a kick to it. The photo below looks like a Peanut Butter Brownie Sandwich from Earl of Sandwich, but I swear, it’s a burger! I did try the bun and it doesn’t really have a special “flavor.” The bun was grilled a bit, so it did have a nice texture, a tiny crunch as you bite down, but soft on the inside. Heading back over to the Light Side, here’s a look at the Cheese-3PO Burger. 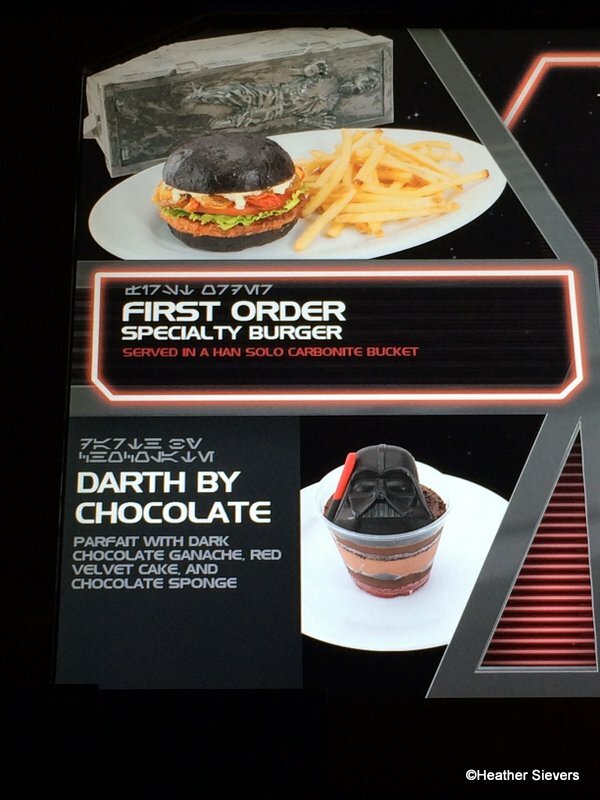 Your typical counter service cheeseburger, the Cheese-3Po is served with Fresh Fruit or French Fries. This patty is all beef, no chorizo. 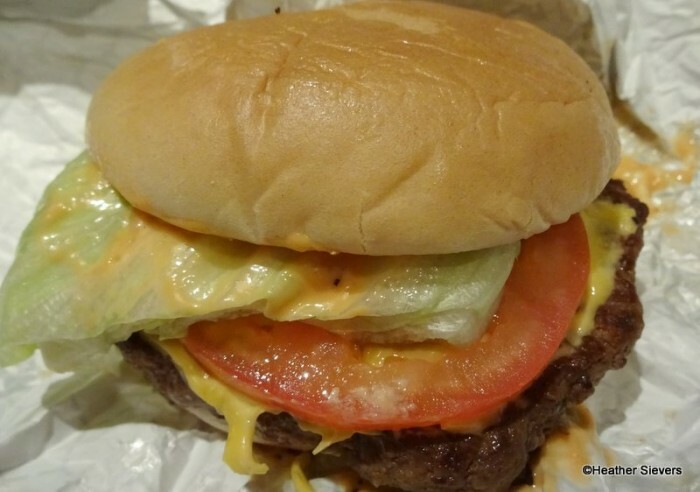 The burger is topped with cheese, tomato and lettuce, but it can be ordered plain as well. 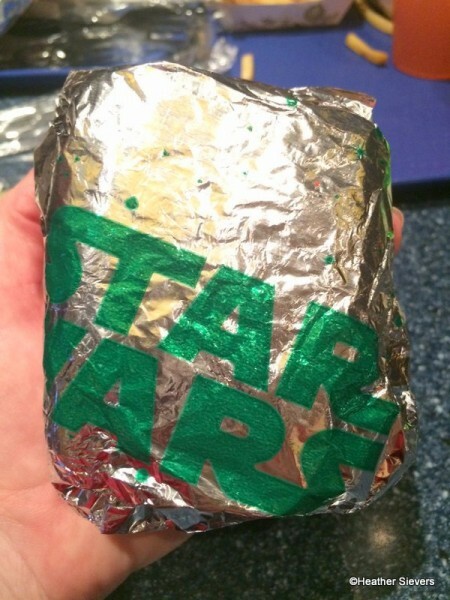 All of the burgers and sandwiches come wrapped in themed Star Wars foil. 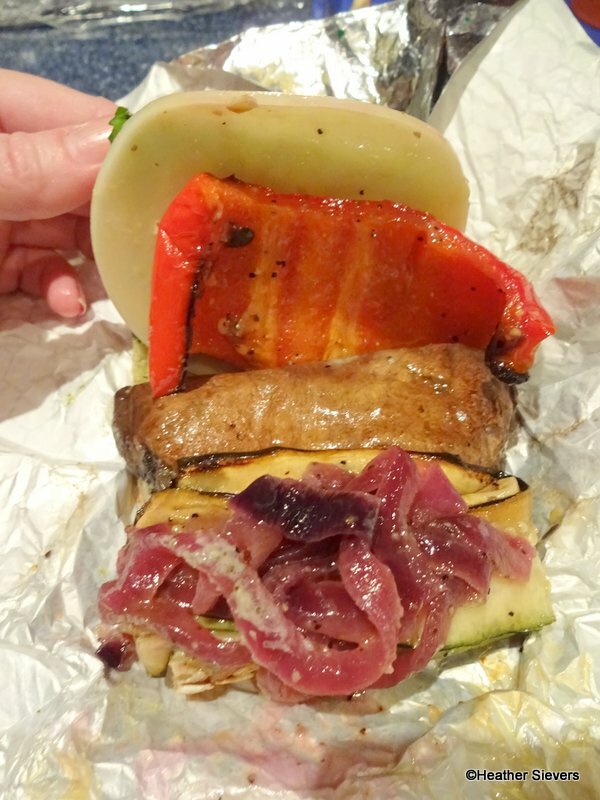 Below is the Wicket’s Wicked Veggie Sandwich. Wicket’s Wicked Veggie Sandwich is described as a Portabello Mushroom & Vegetable Sandwich. This sandwich is served warm on a fresh roll. The Portebello Mushroom is topped with Red Peppers, Onions, Lettuce, and Zucchini. 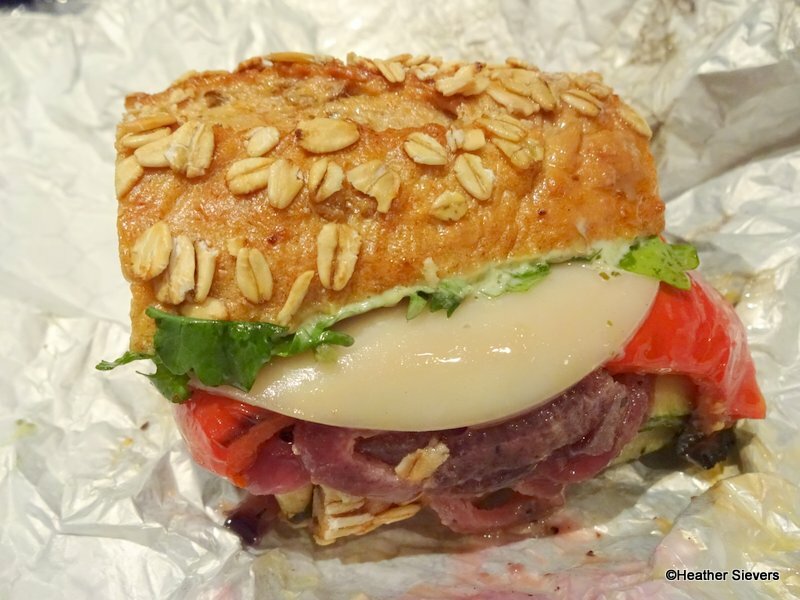 I really enjoyed this sandwich and think that it’s a great vegetarian option. It was a bit messy to eat, so I ended up eating it open face with a fork and a knife. The Chopper Salad is up next. 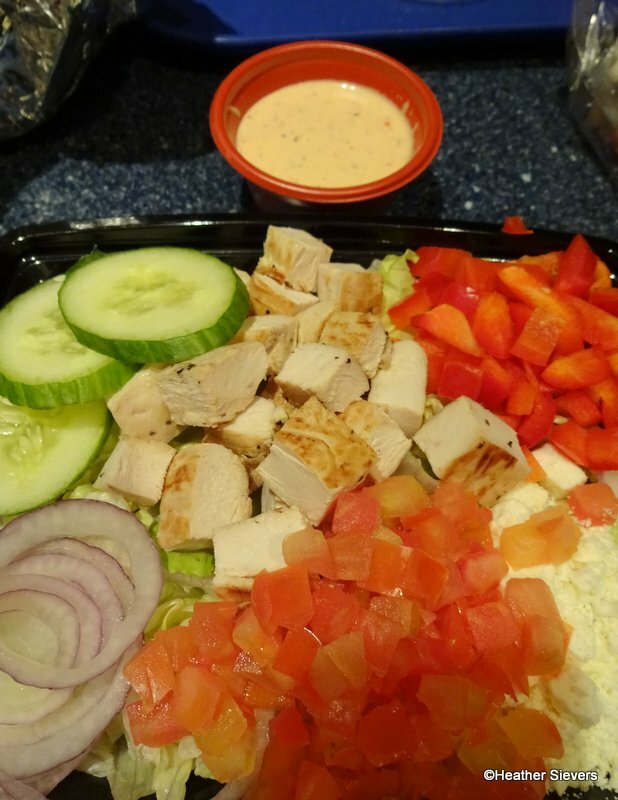 This salad comes topped with Grilled Chicken Breast Chunks, Feta, Cucumbers, Tomatoes, Onions, and Red Peppers. Red Pepper Ranch Dressing is served on the side. I thought that this salad was really well done, the veggies were crisp and fresh and the dressing had a subtle but enjoyable red pepper flavor to it. 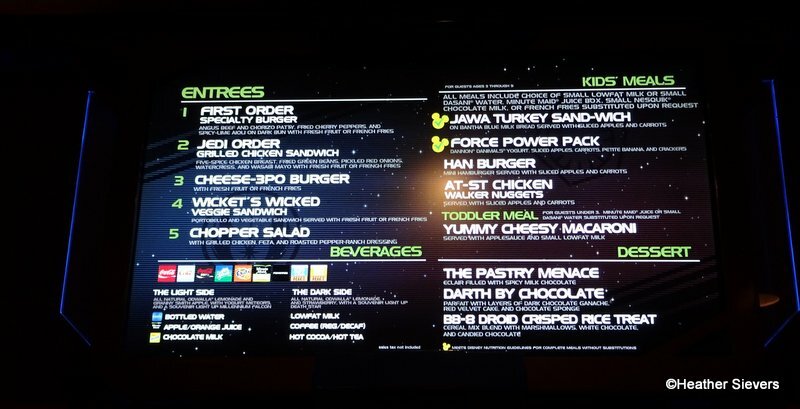 I didn’t have a chance to try the Jedi Order Chicken Sandwich, which I’m mad at myself for not grabbing! Somehow I accidentally skipped it when ordering, but it sounds really interesting; Five Spiced Chicken Breast topped with Fried Green Beans (the Trader Sam’s ones! ), Pickled Red Onions, Watercress, and Wasabi Mayo. It’s served on a fresh bun with a side of French Fries or Fresh Fruit. There are 4 different options for hungry little Padawans. My boys eat off of the adult menu, but I had to check out the Jawa Turkey Sand-Wich. Served on Bantha Blue Milk Bread, the sandwich comes topped with Lettuce, Tomato, and a generous portion of Turkey. 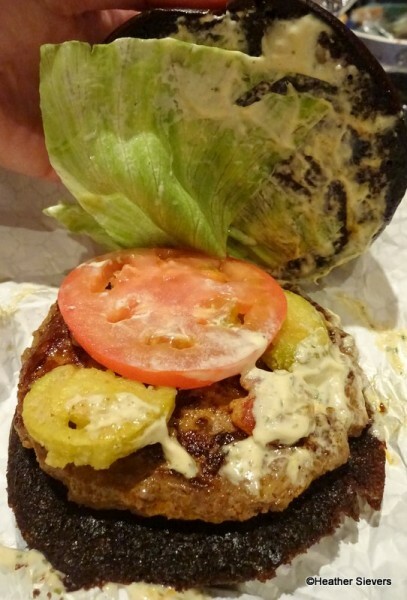 It is served dry, which makes it easy to remove unwanted tomato or lettuce — and condiments are available if you need mustard or mayo. 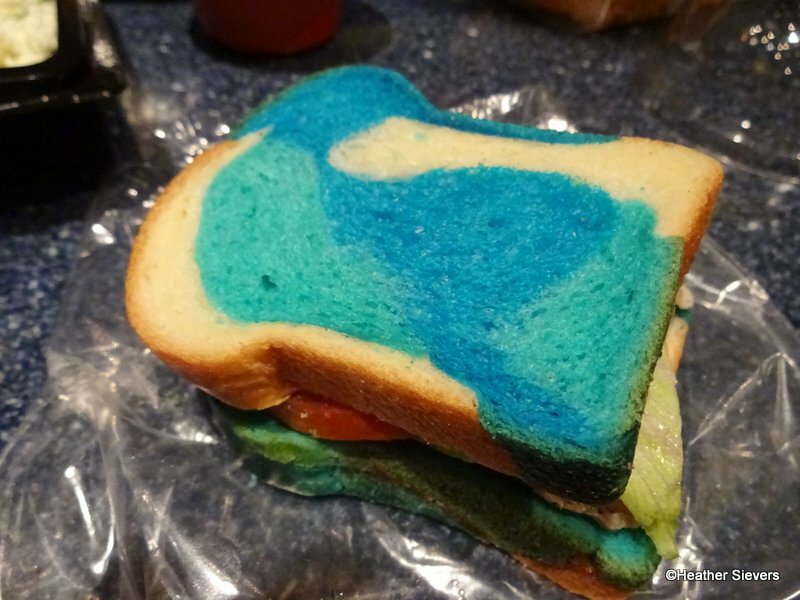 I love the blue bread. 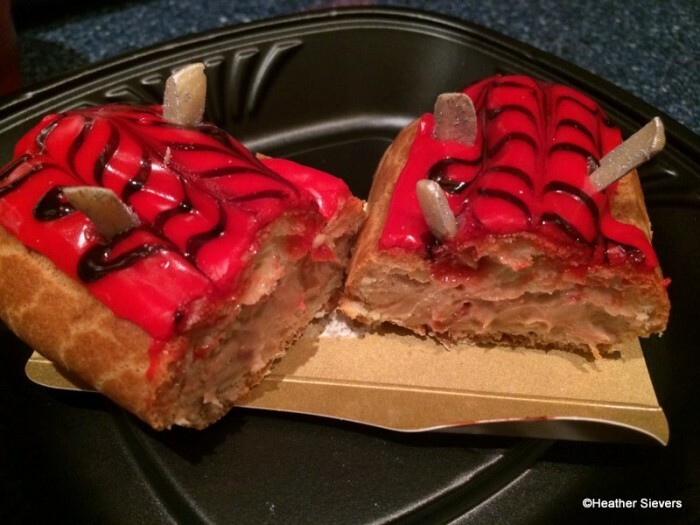 It isn’t flavored, just colored; and it’s made specially for Disneyland! 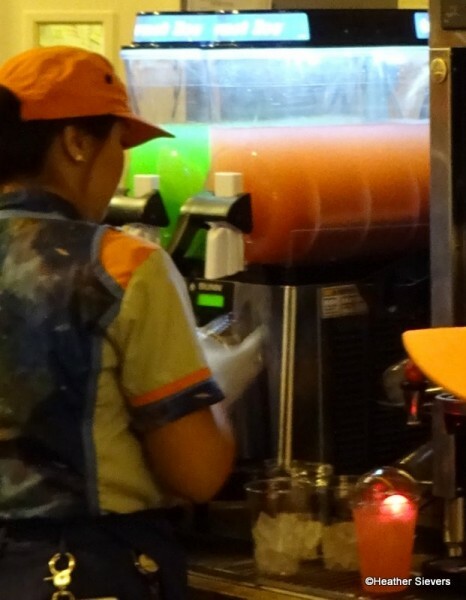 Other kids’ meal options include a Force Power Pack (Dannon Danimals yogurt, sliced apples, carrots, petite banana and crackers), a Han Burger (mini hamburger served with sliced apples and carrots), and AT-ST Chicken Walker Nuggets (served with sliced apples and carrots). For toddlers there is a Yummy Cheesy Macaroni Meal that is served with applesauce and a small milk. 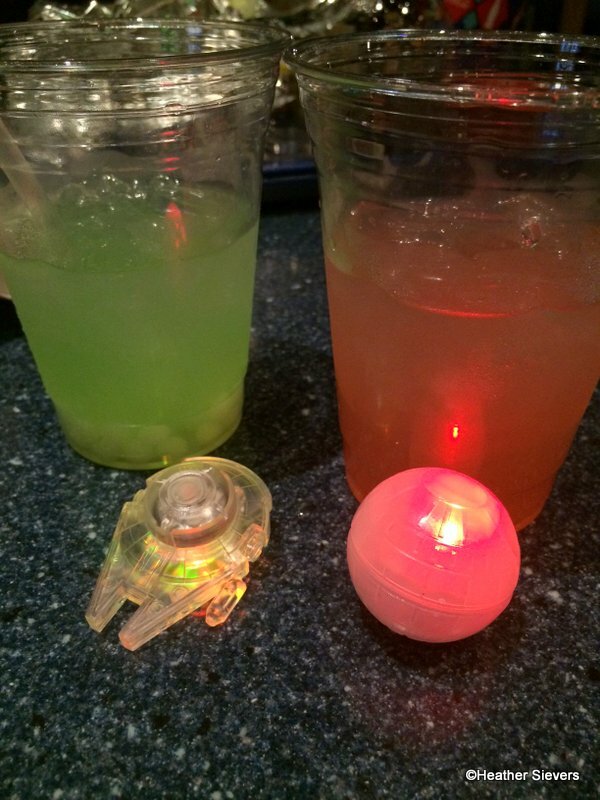 Looking to quench your Galactic thirst? 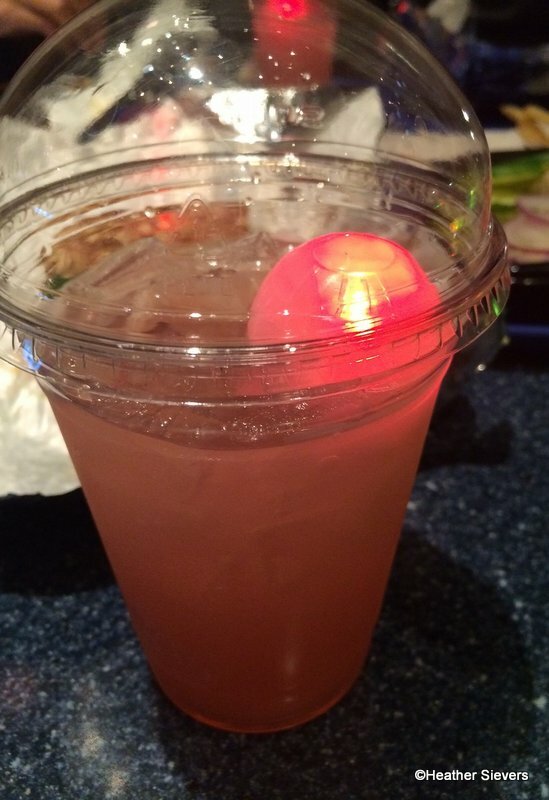 Make sure to try one of the new Specialty Lemonades. 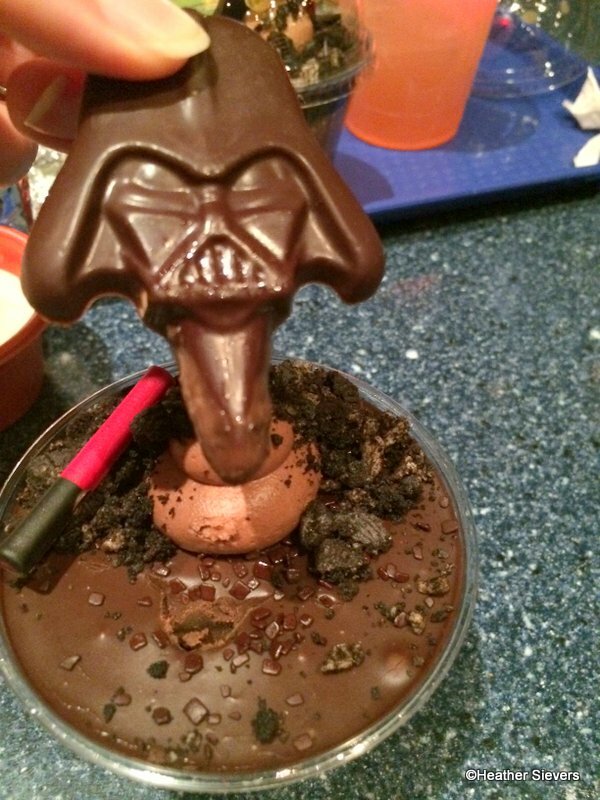 You can choose from the Dark Side or the Light Side, each with its own unique ingredients. Dark Side Lemonade features All Natural Odwalla Lemonade with Strawberry Slush. It comes with a Souvenir Light Up Death Star. 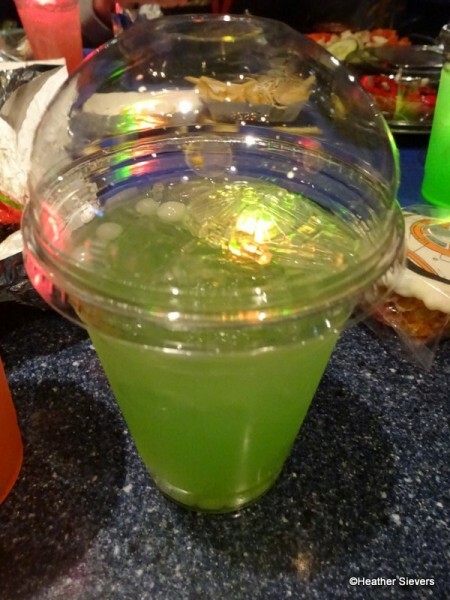 Light Side Lemonade features All Natural Odwalla Lemonade with Granny Smith Apple Slush, Yogurt Meteors and a Light Up Millennium Falcon. The yogurt meteors are vanilla flavored boba-type treats that burst in your mouth. These new lemonades were so much fun to try. My whole family loved both flavors and those new glow cubes (the same ones used at Star Wars Weekends in Disney World) were a huge hit, too. 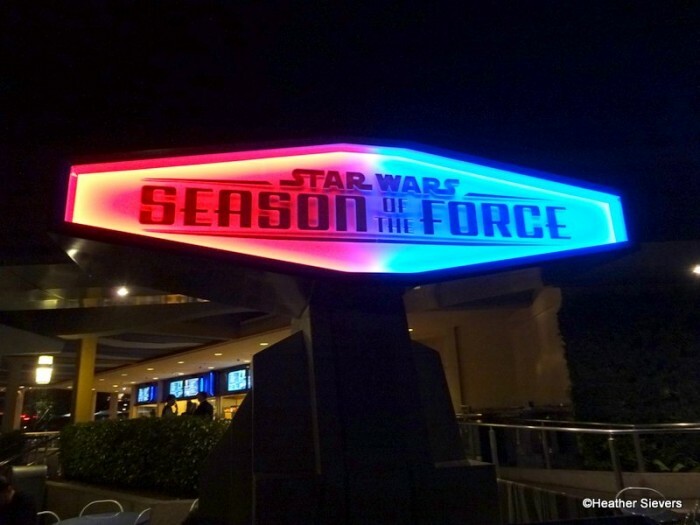 I have to say though, I think that the Dark Side was my favorite! Light Side v Dark Side! Coca Cola Products as well as Apple Juice, Orange Juice, Milk, Chocolate Milk, Coffee, Tea and Hot Cocoa are available. 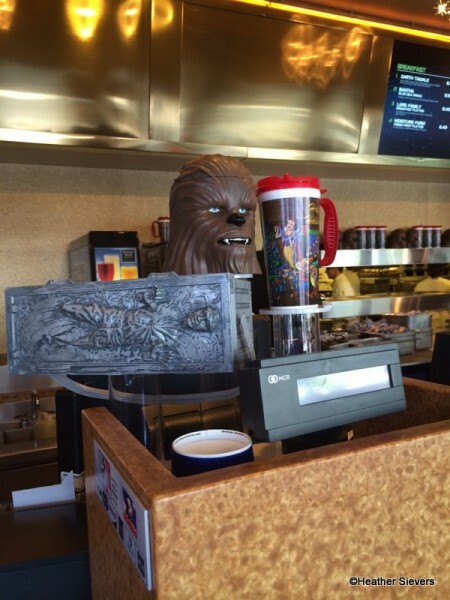 For an additional charge you can wookify your beverage and have it served in a Chewbacca Stein. Another fun upgrade? You can also order your meal in a Han Solo Carbonite Lunch Box! Now, let’s talk about dessert! 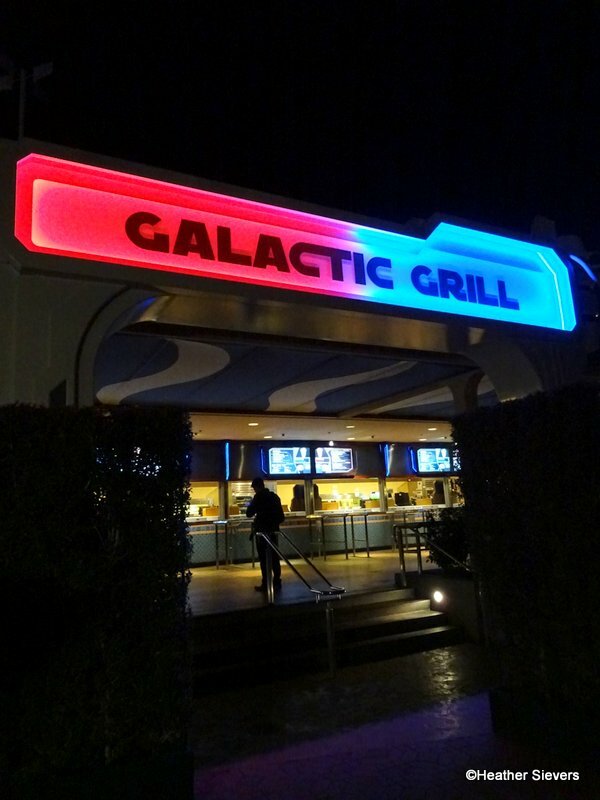 There are three different treats on the menu at Galactic Grill. Let’s start with The Pastry Menace. 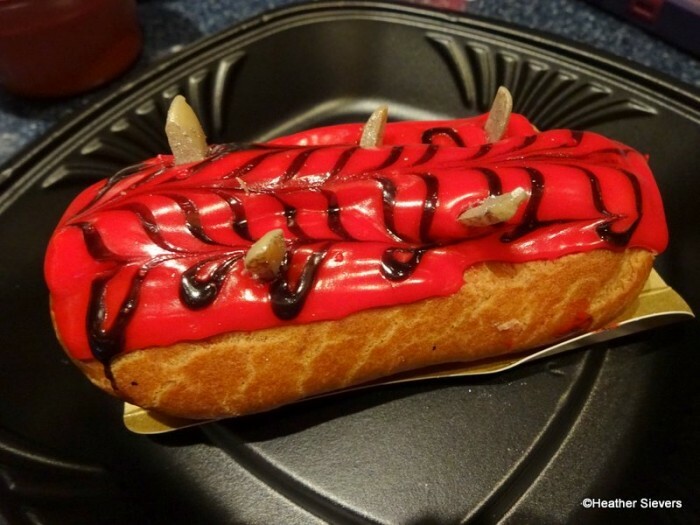 This Darth Maul Inspired Eclair is topped with red frosting, chocolate feathered details, and almond “spikes.” It’s filled with a “spicy” milk chocolate cream center that has the consistency of pudding. I didn’t notice the spice when I first bit into the pastry, but it hit me a second later. It’s more of a cayenne type of spice than a cinnamon spice. I enjoyed this dessert and thought that the design was extremely clever. The Darth by Chocolate Parfait is a must for any chocolate lover. The dessert is described as a parfait layered with Dark Chocolate Ganache, Red Velvet Cake and Chocolate Sponge. 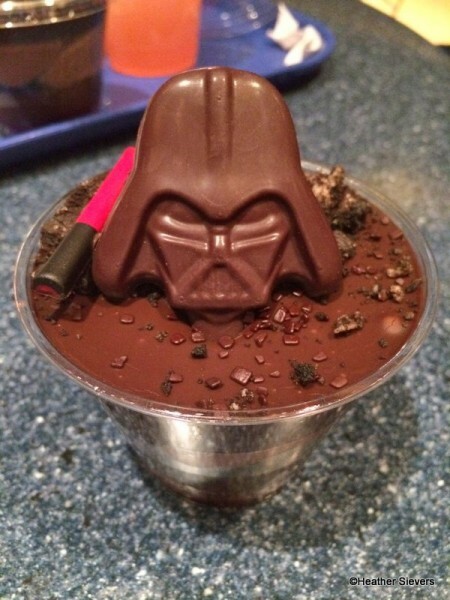 It comes topped with Chocolate Flecks, Crushed Chocolate Cookies, a Chocolate Darth Vader Head and a Mini Chocolate Lightsaber. I will be honest with you, I did not notice the Red Velvet Cake in this. I really thought it was solid layers of chocolate when I tried it. For me though, that’s a good thing, because I’m not a red velvet fan! 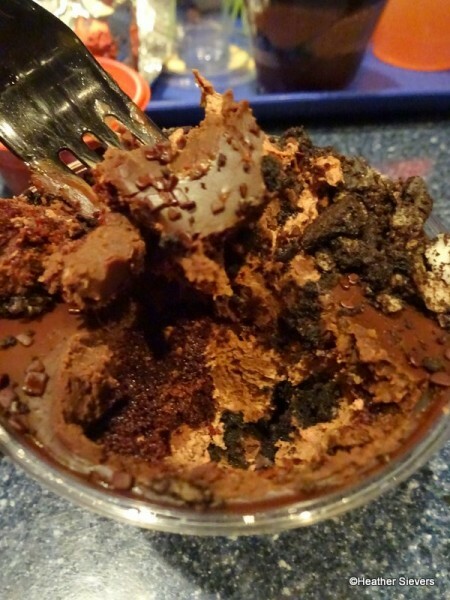 Each layer had different textures, creamy ganache, spongy cake, crunchy cookie bits; a great combination all in one little cup! This one is really rich, so I recommend sharing if you don’t want a stomach ache! Chocolate on Chocolate on Chocolate! 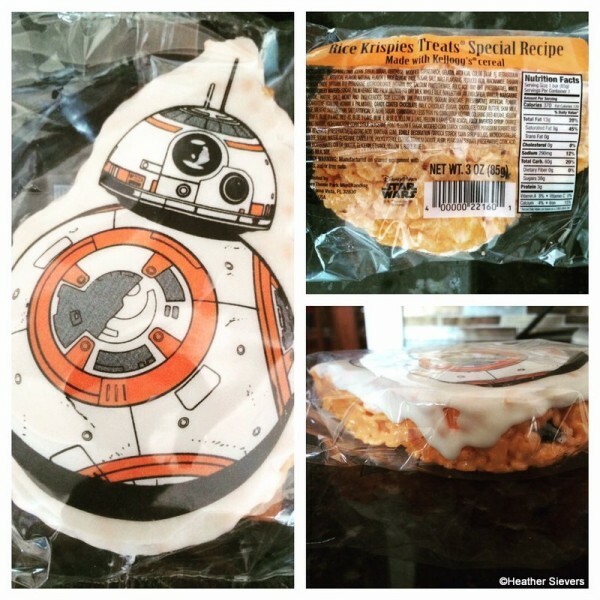 The third option is a really adorable BB-8 Rice Krispies Treat. The orange colored Rice Krispies make up BB-8’s body. They are mixed with black and orange M&M’s candies and it’s topped with white chocolate and an edible BB-8 image. This was a huge hit with my entire family! I’ve also seen these at other locations including Pizza Port. On a side note, this is the first time I’ve noticed the use of actual “Kellogg’s Rice Krispies Special Recipe” on the packaging of a Disney Parks Krispy Treat. In the past I thought I remembered them being called Crisp Rice Treats. You better believe I came back the next morning to check out the Galactic Grill Breakfast Menu! The selection isn’t huge, but I think that the 4 adult entrees and 2 Kids’ Meals have enough of a selection to make anyone happy. 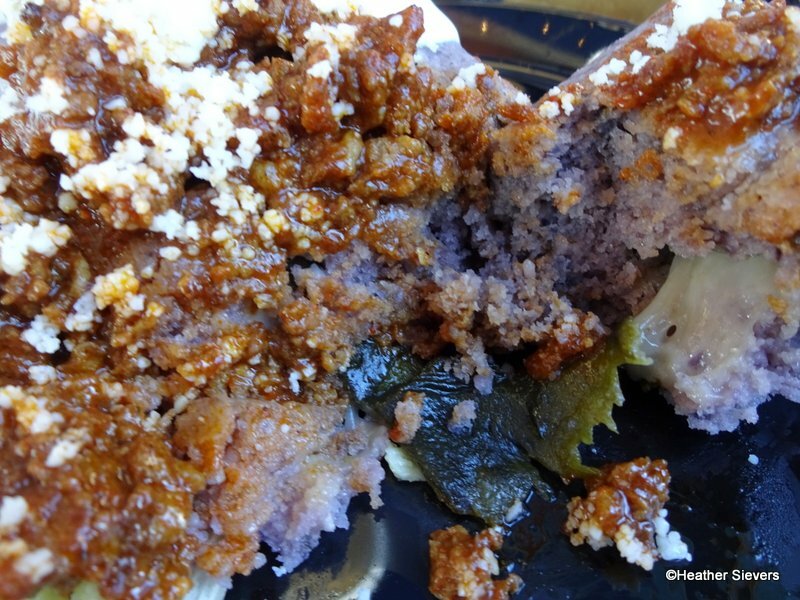 The two things that were a must try for me were the Darth Tamale and the Bantha Blue Milk Bread French Toast. Let’s start with the Darth Tamale. The Darth Tamale is a Blue Corn Tamale topped with Scrambled Eggs, Chorizo, Chili Sauce, Tomato Salsa & Cheese. Although it looks a little upappetizing after being partially eaten, it’s actually quite delicious. 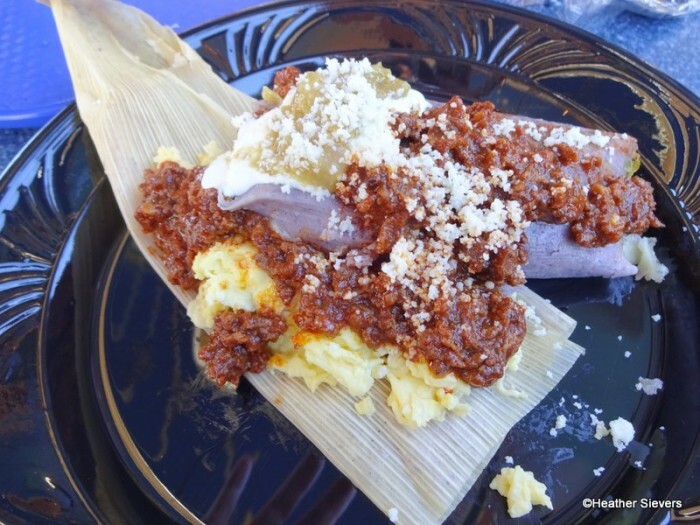 The tamale was moist and the scrambled eggs were cooked to perfection. The chorizo had a little kick to it but nothing too spicy. I really thought this was a great counter service breakfast. 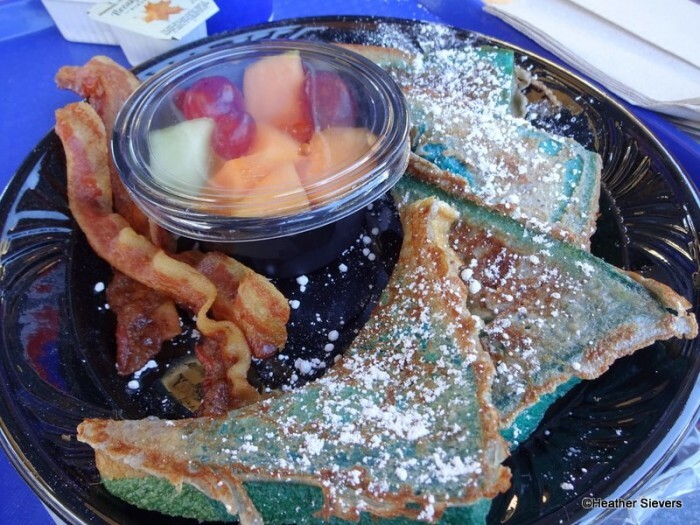 I can also speak highly of the Bantha Blue Milk French Toast. Made with the same Bantha Blue Milk Bread (only larger slices) as the Jawa Turkey Sand-Wich, the French Toast is served with a small cup Fresh Fruit and 3 Slices of Bacon. I must add that the bacon was actually crisp, warm and cooked perfectly. I was surprised, because my past experience with counter service breakfast bacon hasn’t been that way. It’s usually floppy and cold… . This was a nice surprise! The French Toast was sprinkled with powdered sugar, so you really don’t see that bright blue until you take a bite! Although I did not order it, I was able to snap a photo of the Lars Family Breakfast Platter. 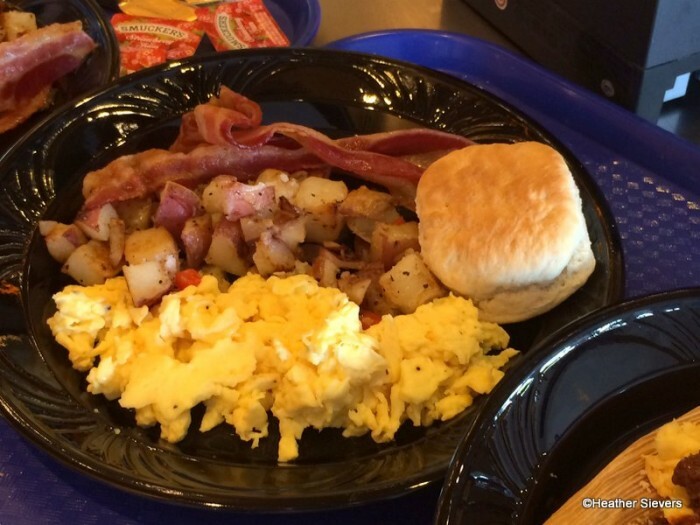 This meal includes Scrambled Eggs, Bacon, Breakfast Potatoes, and a Biscuit. It looked pretty great too! 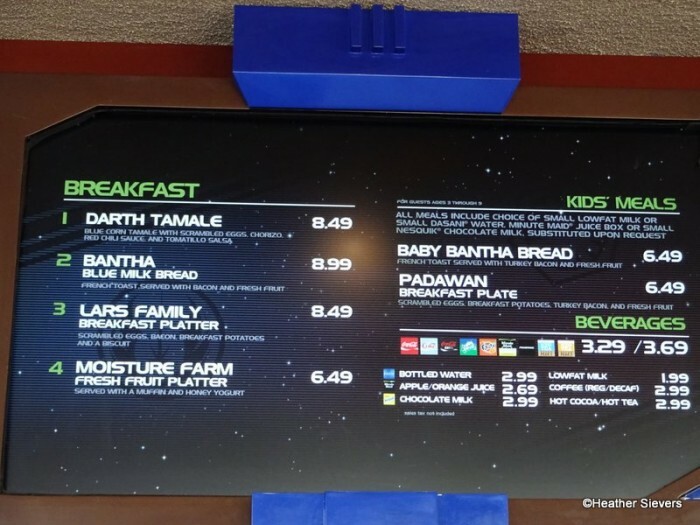 There are two Kids’ Meal options; the Baby Bantha Bread French Toast, which comes with Turkey Bacon and Fresh Fruit; and the Padawan Breakfast Plate, which comes with Scrambled Eggs, Breakfast Potatoes, Turkey Bacon and Fresh Fruit. For detailed menu pricing click here. 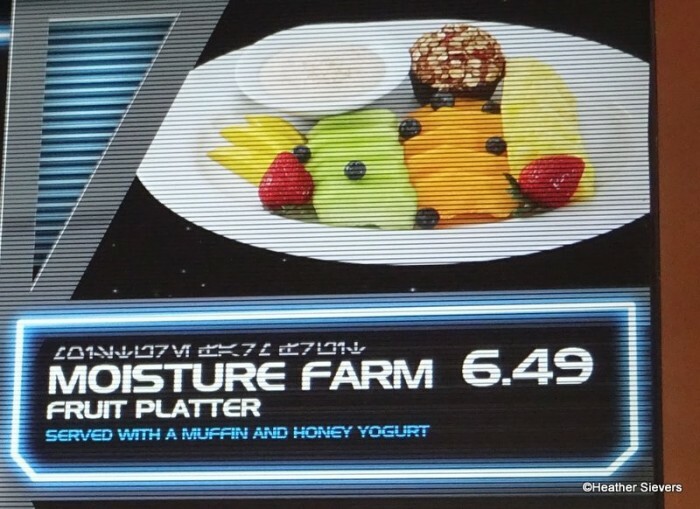 Overall, I think that the menu items at Galactic Grill are clever and fun. The food is fast, convenient, affordable and there’s plenty of seating. 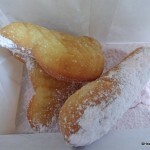 I thought that the breakfast was fabulous and I really enjoyed the lemonades and desserts. Thank you so much to Disney for having my family and me as guests! I don’t care about Star Wars yet I want to hop on a plane right now and try all of this stuff EXCEPT for the blue bread. I don’t think my brain convince my tongue (or maybe it’s vice versa) that I am NOT eating moldy bread. My sister works at Backlot Express in DHS and they had a class yesterday and will tomorrow about the new force menu they will be serving. I think she said it was starting December 1. 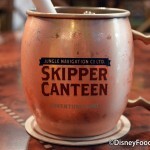 We are very excited to try it when we go December 5!! Jennifer G. – Cool! I am visiting WDW over Christmas! Can’t wait to see the similarities and differences! 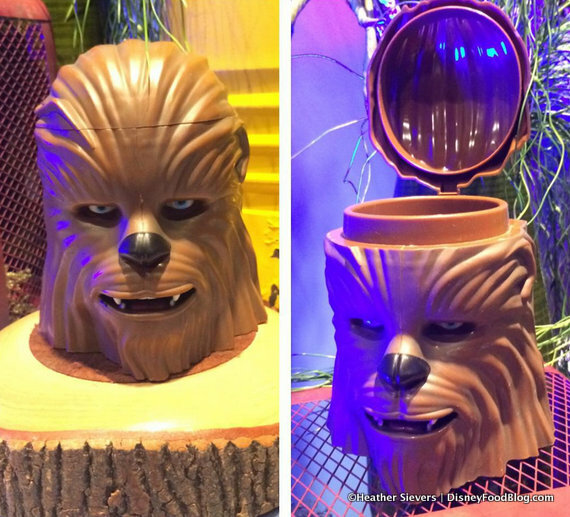 Is it just me or does that Chewie cup look like the monkey brains scene from Temple of Doom? David – I actually had someone on Instagram say the same thing! 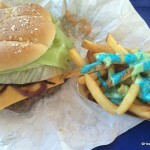 I don’t like the blue dye either, but otherwise, I think the food looks pretty good for Star Wars fans. I wonder why there aren’t any prices showing on the menu boards? It all looks interesting. 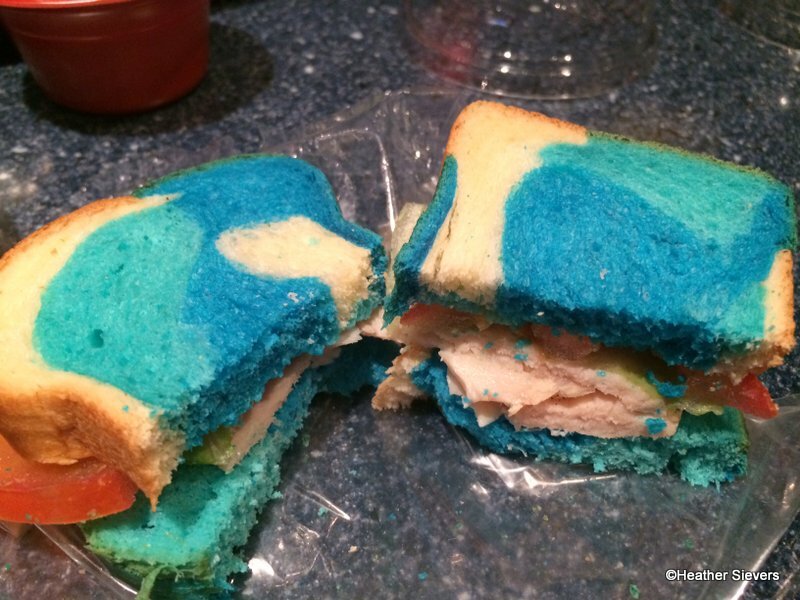 To me the blue bread looks fun. 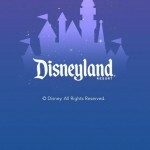 Perfect for Disney. I will be getting the french toast. Reminds me of the cheesecakes i made when my kids were little and they would add wild color swirls. Januarys trip will be racing and eating, great combo. Trina – I loved the blue bread! Your trip in January sounds perfect! 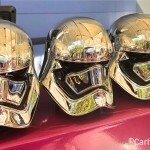 The Cheese-3PO burer should use 3 cheeses on the burger. Seems like a missed opportunity. 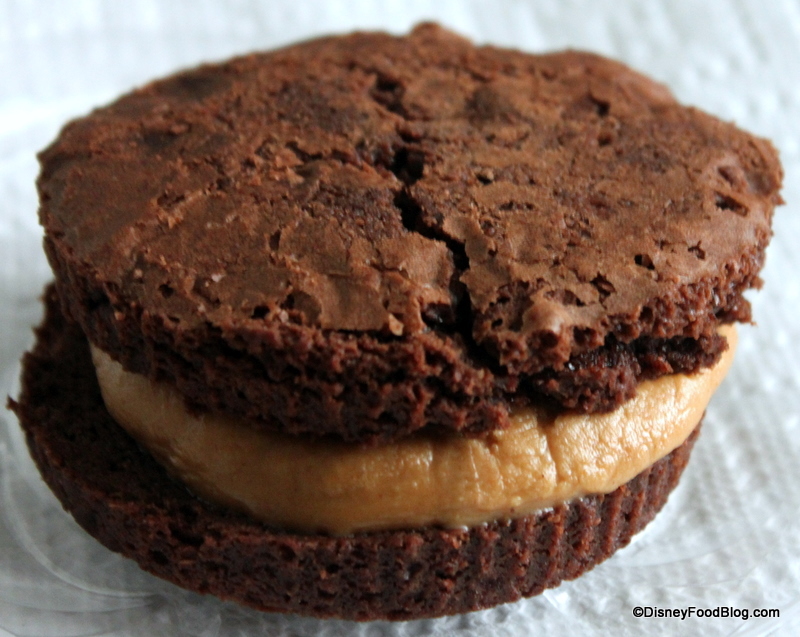 Some of these are cool but some are surprisingly pretty boring compared to some foods Disney has had. 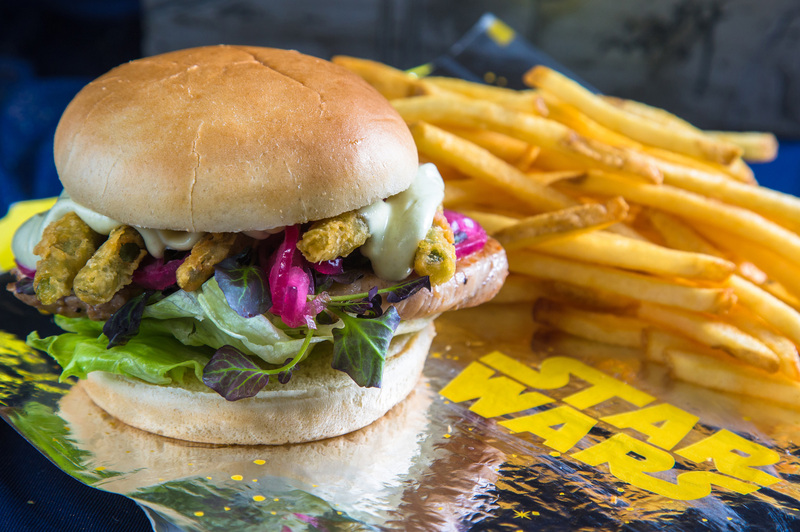 John – 3 Cheeses would have been a great idea for the Cheese 3-PO burger! 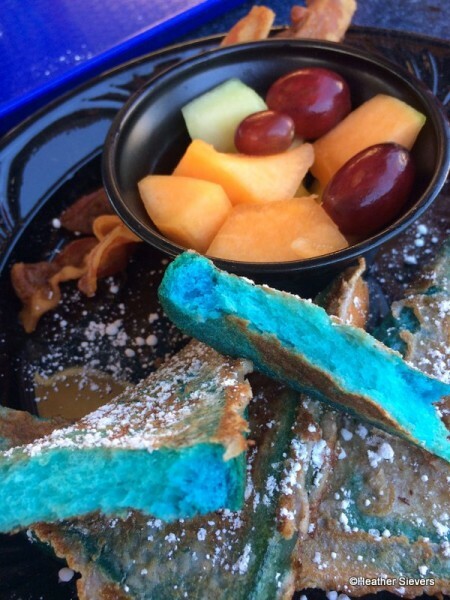 Anyone know if blue milk french toast is still available?